Positioned 2 kilometres to the east of Adelaide, South Australia's capital, visitors can reach the vibrant district of Kent Town. Visitors hoping for an experience-packed trip to Adelaide will love all its attractions, such as the Victoria Square, Government House and Rundle Mall. Looking around Kent Town and its surrounding area almost always includes taking some time to see the Adelaide Botanic Gardens and the Art Gallery of South Australia. Close to the Adelaide Festival Centre, in the same section of Kent Town, travellers can stay at the Hotel Richmond on Rundle Mall, La Loft Apartments, Mansions on Pulteney, iStay Precinct and Sage Hotel Adelaide. If you've got some spare moola left over this month, visit Burnside Village Shopping Centre to purchase the essentials and a treat for yourself! Want to kick your heels up not far from this place? Check out the rates at the Apartments On George and Arkaba Hotel. Take your mates for a picnic or a relaxing afternoon walk around Adelaide Parklands. The Clarion Hotel Soho and Quest on Franklin are your leading choices for this attraction. An excellent Kent Town cafe, Sugar Shack Diner is well worth popping into. Sit down with a magazine, treat your tastebuds to some sweet treats or just pick up a coffee to go. Once the caffeine kick wears off and your stomach starts hankering for some heartier fare, check out the menu at Stamford Plaza Adelaide. This well-patronised eatery plates up some seriously tasty food. And of course, you haven't fully experienced Kent Town until you've said hello to the locals at the neighbourhood bar. Here, Hotel Richmond is the place to be. Don't stress if you can't locate the best room in Kent Town. 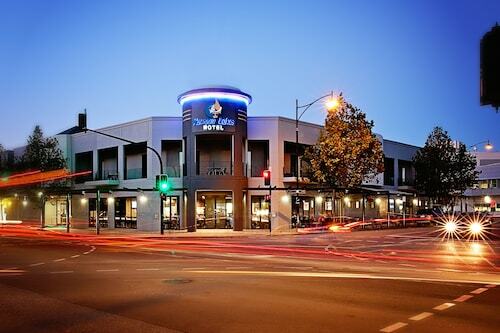 You'll discover more places to stay in the Hackney hotels guide and the Wotif Adelaide CBD hotels guide. Hackney is about 0.9 kilometres from Kent Town and Adelaide CBD is 2 kilometres away from Kent Town. Kent Town offers travellers plenty to do and some great places to stay. Come on, you know you deserve a vacation, so when it's time to make tracks to Adelaide or anywhere else on this incredible planet of ours, Wotif can take you there, on time, on budget and in style. How Much is a Hotel Room in Kent Town? Hotels in Kent Town start at AU$80 per night. Prices and availability subject to change. Additional terms may apply.